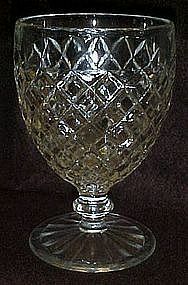 Nice large waffle or Waterford pattern water goblet by Anchor Hocking Glass. Measures 5 3/4" tall and sits on a nice stem foot base. Holds 11 0z. I have 3 available and all are in perfect condition. Price is for each goblet. I have other pieces to this pattern listed. Save on postage by ordering more!